This email isn't quite as slick as some of the phishing emails we've seen lately, but it's convincing enough to trip people up. Fortunately it also bares the hallmarks of the classic phishing scams, which means we can use our tech smarts to see through the deception. There's not a lot of information to figure out whether this is legitimate or not, but luckily for us there's enough red flags. Here's our top tips on figuring out whether that email that's just landed in your inbox is really from Netflix, or whether to send it straight to junk. If you're a busy person, you probably don't diligently read every email that arrives - it's more likely that you give it a quick scan, send a speedy reply, and move onto the next one. In this phishing email, the scammers are hoping you don't read it too closely. Whoever is on the other end is hoping that between the bold 'Billing information' and the huge Netflix logo, you'll click that dodgy looking link and head straight to an even dodgier website with your card details ready. If you actually give this a good read, you'll notice that the sentence structure isn't exactly right. 'So that you can continue to enjoy all the benefits of your account' sounds just a little bit off. A lot of these scams are written in someone's second language, not their first, which is a great indicator for us. The team at Netflix is only going to send an email to their subscribers after it's been edited and proof read by a handful of people. So if it reads a little oddly, you might have caught a phisher. A great indication that you're reading a phishing email is when the sender tag says one thing, but the 'From' address says something completely different. That's not to say that scammers can't forge a 'From' address - it's just that, for whatever reason, a lot of phishing emails don't seem to bother. Either way, it's great for us tech savvy recipients because an email from Netflix should always have an email address that ends with 'netflix.com'. As you may have noticed, although the sender tag says 'Netflix', the email is actually from a ridiculously excessive list of numbers which eventually ends with 'revenue.ie'. This is a huge red flag, and lets you know that whoever is on the other end of this email address isn't somebody you should be trusting with your banking information. This next trick is a good way to find out exactly where those links are sending you, but if you're opening up an email on your phone or mobile device, this might not be an option. If you've checked the sender, and read the email and you're still on the fence - and you're on a smartphone - fire up your laptop for this last little tip. If you hover your cursor over any link, you'll see a little box appear with that link's destination on. And it's a great way of figuring out phishing emails. So what happens when we apply this trick to our Netflix phishing email? Would you believe it, these trustworthy individuals are not sending us to our Netflix account to update our billing information. Instead, it looks like we're heading to the far less legitimate sounding 'matratzun-markus.de'. 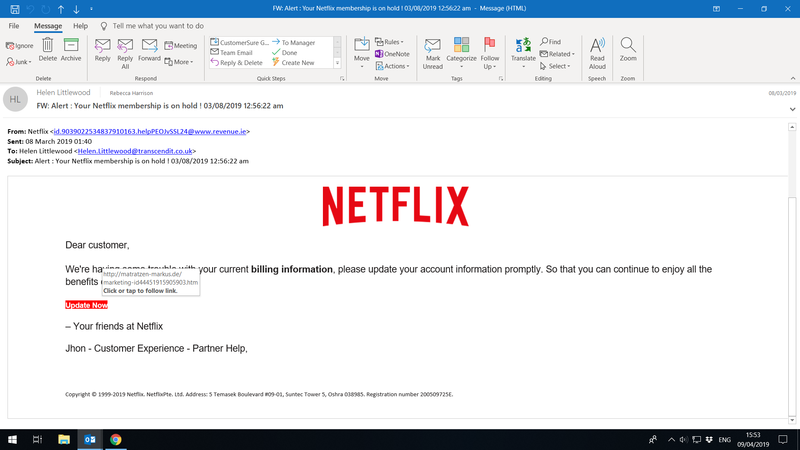 We didn't click this link so we can't tell you what you'll find on the other end, but we're guessing an imitation of a Netflix website where scammers can nab your Netflix information and then your card details for good measure. I'm still not sure if it's a phishing scam or not? If you're on the fence about whether an email you've received is legitimate, or its from an unscrupulous individual pretending to be somebody legitimate, don't click any links in the email. Instead, head to the website directly (in this case, Netflix) and check whether your account really has been blocked. And if everything looks fine, send that email to junk.